✔ You gave this recipe a 3 star rating. 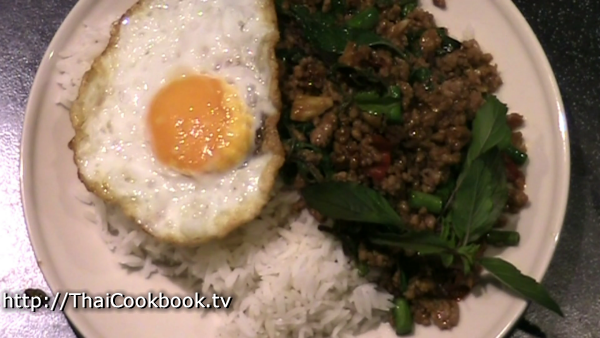 Pad Kaprow (ผัดกะเพราหมู) is probably one of the most popular dishes in Thailand. It's a spicy stir fried dish made with chopped pork, basil, chilies, and garlic, and it's perfect for a one-dish meal over rice or as a side dish at a family style dinner. If you have been lucky enough to visit Thailand and had this while you were here, then you know that nothing beats Pad Krapow, except maybe Pad Kaprow Kai Dow (served with a fried egg). 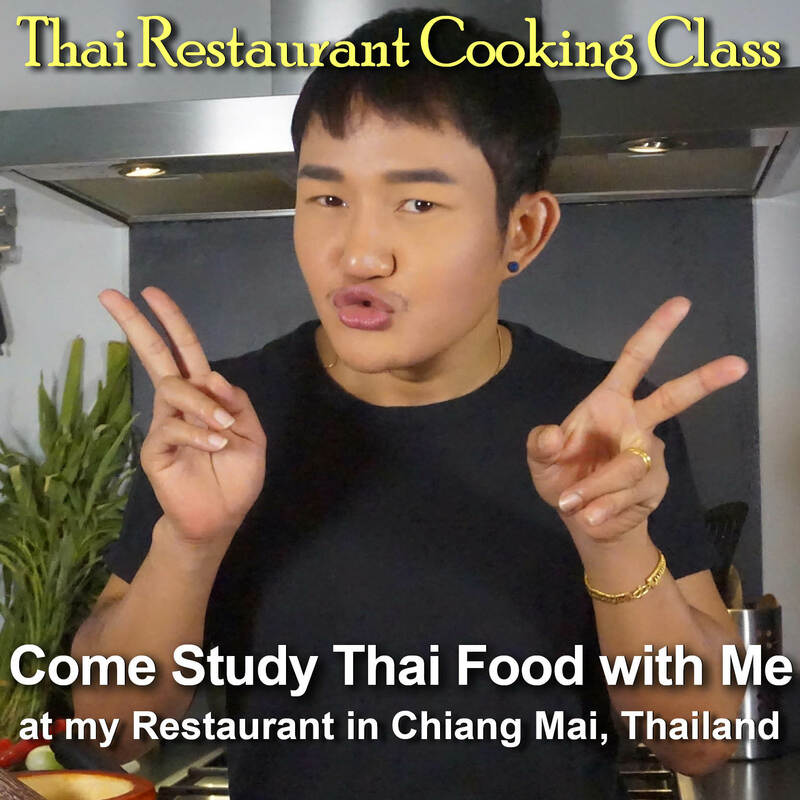 It's actually quite easy to make, and now you can try it at home with this restaurant perfected recipe from Worawut. What's in our Stir Fried Pork with Basil. 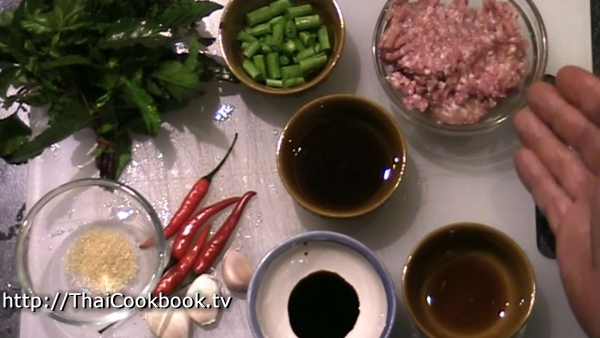 How we make our Stir Fried Pork with Basil. 1) Fry one egg and have it ready. 2) Crush the garlic and chilies together, then fry them in oil for about 30 seconds. 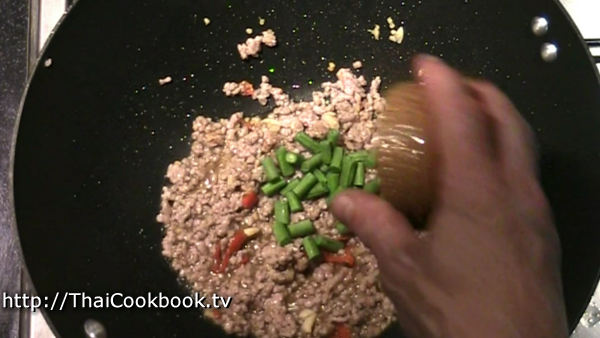 3) Add the ground pork and stir into the chili and garlic. Fry until well browned. 4) Add the cut green beans, oyster sauce, sugar, and soy sauces. Fry until the pan starts to get dry, then add a small amount of water. 5) Turn off the heat, then add fresh basil. 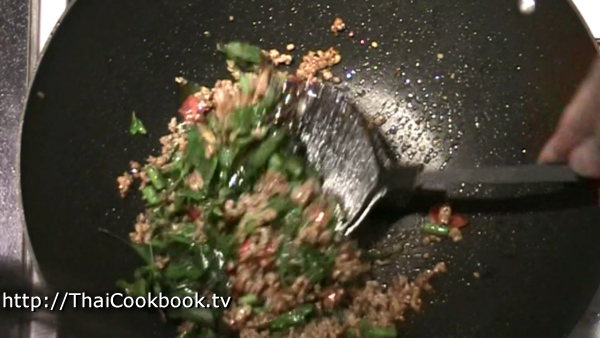 Stir in well and serve immediately with steamed rice. In order for your Pad Krapow to have the right flavor, you really need to use the type of basil that we call Krapow. Krapow is similar in flavor to Holy Basil. It has a strong spicy scent, similar to cloves, or cinnamon. 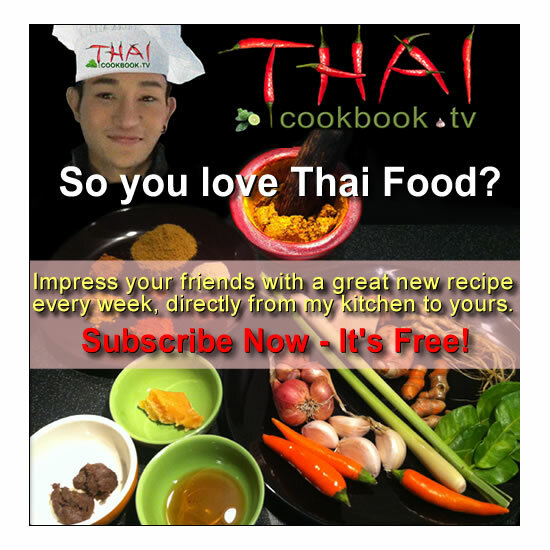 Don't use Horapah, the other kind of basil used in Thai cooking that is commonly called Thai Basil. That has the wrong flavor completely. Measure and prepare the ingredients. Pluck the leaves from your Krapow and cut the green beans into 1/2 inch pieces. Using a mortar and pestle, crush the garlic and chilies. Not too finely crushed, just enough to get the flavors out. You can also just chop them if you want. 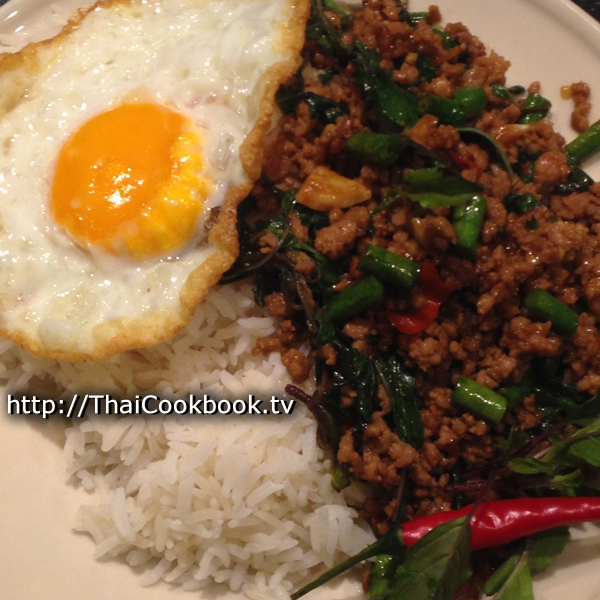 If you are planning to serve a fried egg on the side, then you should fry it before you cook the Pad Krapow. 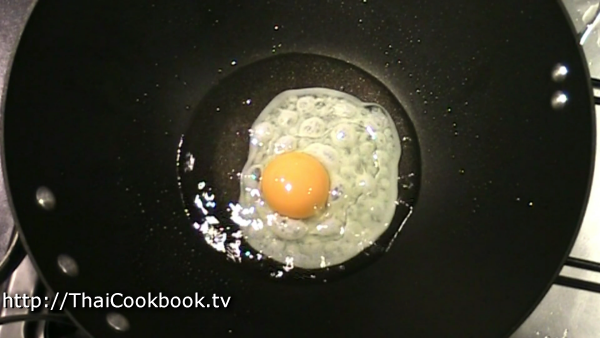 If you want to make a real Kai Dow, then follow the video for my tips, otherwise any ordinary fried egg will still taste great with this dish. 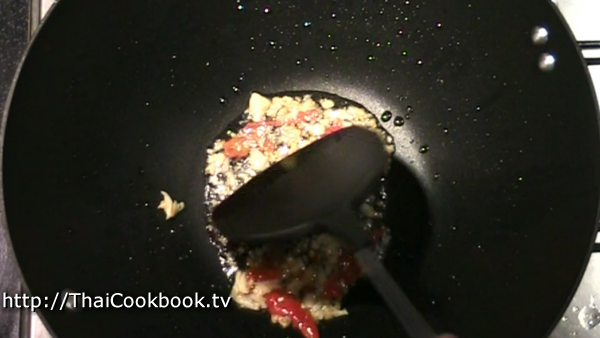 Heat a wok or large frying pan over medium to high heat, and add about 1 - 2 Tablespoon of vegetable oil. When the oil gets hot, add the crushed garlic and chilies. Fry for about 30 seconds. 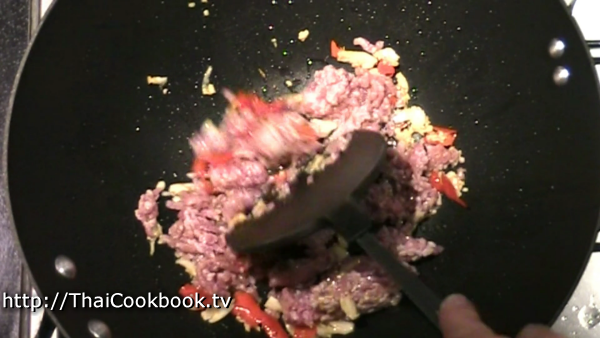 Add the chopped meat to the pan and mix it in well with the chilies and garlic. Fry for about 2 minutes, or until most of the pink color is gone from the meat and you can tell that it is nearly cooked. 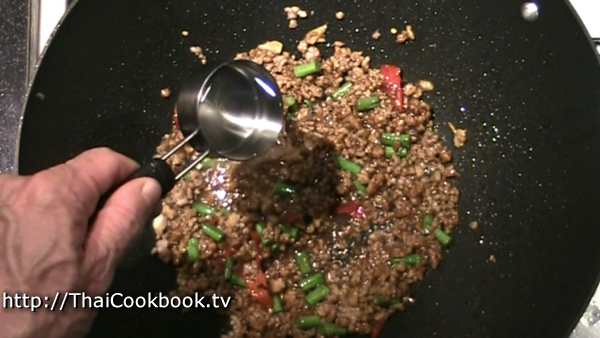 Add the oyster sauce and light soy sauce to the meat and mix it in well. Fry for about 30 seconds. Add the sugar and green beans to the pan and stir well. Fry for about 30 seconds, or until you are sure the sugar is all melted. 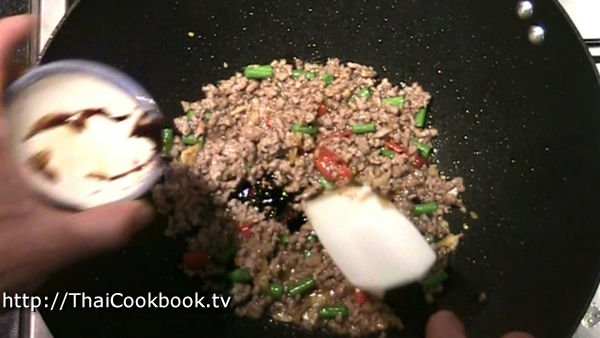 Add the dark sweet soy sauce to the pan and mix in well. Fry for about 1 minute, or until the meat is starting to get a little dry, and you can see it browning and sticking to the pan just a little. This browning adds a lot of great flavor. Add about 1/8 to 1/4 cup of water. 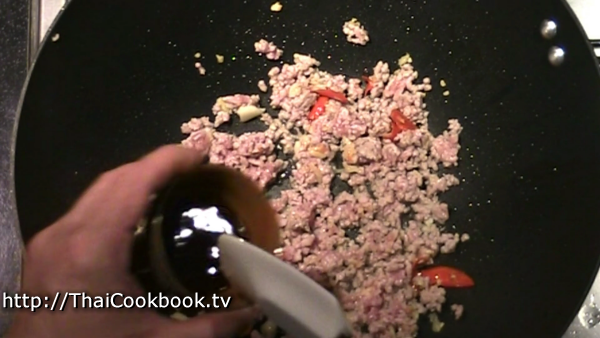 Stir it around and fully deglaze the pan to get all that flavor mixed back into the sauce. Fry for about 30 seconds to reduce the water back into a nice brown gravy. Add the basil in, stirring quickly. Cook just for a few seconds, just long enough for the basil to wilt a little. Remove from the heat and serve immediately. Serve along side some piping hot Thai Jasmine rice and top with a Kai Dow for a delicious one-dish meal, or serve on a small plate to be shared at the table for a family style meal.